Welcome to "Jimmys Hotel" website. Here you can find useful information about the beautiful destination of Taxiarchis on the slope of mountain Holomontas. Jimmys and his three sons have built near to their family tavern wonderful rooms made of stone. In altitude of 850m. in the centre of Northern Halkidiki just thirty minutes from Poligiros, you will find our traditional stone lodgings, capable to provide you all comforts, the hospitality, the tranquility of the marvelous Greek countryside. We promise you that you will have unforgettable moments in a wonderful environment where you can stay, dine with traditional mountain meals, relax in our spa and enjoy your coffe and your drink, watching the three legs of Halkidiki peninsula. 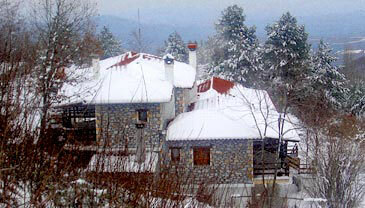 The village Taxiarchis is built in the "aprons" (plagies), on the mountain of Holomonta, which has height 1.165 metres. The older name of village was "Loukovi"changed in 1928 in "Taxiarchis", in honour of the Protector of our Brigadier Michael. Copyright © 2011-16 Jimmys Hostel. All Rights Reserved. Designed by Task.